My journey to fill the pages of Lionel's Melbourne brought me to Brunswick Street in Fitzroy where many have ventured but few have uncovered its secrets. Tram 112 ran along the strip, dotted with what seemed to be a shambolic ensemble of high fashion boutiques, multi-ethnic restaurants, florists, second-hand stores, cafes, art galleries, organic grocer, salons, book stores, jewellers, bars and housing. The pedestrians were a muddling of stencilled street wear, clean shaven suits, T-shirt and old jeans, Haute couture and studded skunks in Doc Martens. I was in bohemian central. I had stared into a piece of her soul and read an espresso of Melbourne in a multicoloured demitasse. Brunswick Street was her universe of local fashion, art and food condensed into one small area. Feeling like Heston Blumenthal faced with a complex dish, I was eager to deconstruct and decipher how the differing elements interacted and flavoured Brunswick Street. With the MasterChef mystery box lifted, my journey of a thousand discoveries begins with a single step off the tram. "Fashion is all about you..."
There is a shop for all fashion senses and impulses along the strip, even if you are Taylor Swift on your off-time in Melbourne with your gal pals and back-up dancers. The tapestry of Brunswick Street is weaved from the cloths of people who work and shop along this public catwalk and their fashion statement is loud and clear. Made in Australia and made by hand is fashionable. Incube8r provides a retail gallery to showcase and support over 90 local artisans of apparel, glass, ceramics, pottery, sculptures, paintings and jewellery. Studio Ingot presents an exhibition program drawing from the innovative and aesthetic styles of over 50 Australian contemporary jewellers and silversmiths who amalgamate precious and non-precious materials into wearable art. Designed and made in Melbourne by siblings who share a love of music and graphics, independent label Tomorrow Never Knows sells heaps of limited edition tees that keep you looking good today and tomorrow. If you are a Tim Burton film buff looking to remodel your room into a macabre of supernatural meets industrial science, look no further than Mark Denver. This antique and industrial store delivers quirkiness in the form of stuffed deer heads, life-size Jesus statues, medical dummies, giants eyes, old ship models etc. Suddenly Weird Science is fashionable. A majestic entrance of lush foliage perhaps inspired by Ludwig Bemelman's children books where "In an old house in Paris that was covered with vines, lived twelve little girls in two straight lines... the smallest one was Madeline" welcomes the visitor into Fitzroy Nursery. A garden oasis in the busy concrete of Brunswick Street, this unique inner city nursery has been keeping the green thumb movement alive for 30 years with its extensive garden ingredients of indoor-outdoor flowers, herbs, plants, ornaments and water features. Green becomes fashionable, especially when accompanied by corrugated iron cow sculptures splashed with vibrant colours and tagged with names to add artistic flavour. The metallic artistry continues in Flowers Vasette's exterior signage, flight of bumble bees and raunchy Venus fly trap that starred in Frank Oz's 1986 Little Shop of Horrors movie. Mainstream Australian and international labels remain fashionable and no one says it louder than Liquid Fashion with 3 of its 4 retail stores located in funky Brunswick Street. It offers streetwear to cocktail, designer sunglasses and accessories from quality Australian and international labels for both genders such as Alice McCall, Zimmerman, Wayne Cooper, Trimapee, Diesel, Custo, Roberto Cavalli etc. Antiquated glamour is fashionable, both for your body and your boudoir. Harem Melbourne feeds the passion for one-only or limited edition vintage-styled garments that celebrate Chinoiserie and exotic inspired decadence on the feminine form. Vintage fashionistas can also style their abodes with the nostalgic romance of heirloom-worthy home wares that complement stylish contemporary living. The devotion to vintage continues at Hunter Gatherer, a community store or "op shop" of the Brotherhood of St Laurence where you can buy frocks, blouses, handbags, skirts, coats, trousers, hats and shoes handpicked from hundreds of thousands of wardrobe items donated to the charity. The added bonus of fashion indulgences at this store is knowing your purchases fund programs that help poor and marginalised people. Brunswick Street makes a bold statement about fashion that also borders on the profound. While the major fashion houses of Milan and Paris seek to attire you into their image, Brunswick Street is all accepting. And here on the catwalk strip, you are the model. And you are adding to the fashion cosmic of Brunswick - I am here. Accept me. Love me. "Art lives here in Brunswick Street..."
If fashion is the body, then Art is the fiery blood that pumps through the Brunswick veins. It is the unconventional fusion of different artistic elements that piques your curiosity with its visual ostentatiousness and then proceeds to excite your tactile senses. Melbourne wears its graffiti proudly and the street art of Brunswick Street simply overwhelms and shallows you in its bold colours and powerful messages. Their stencil, stickers and large paste-ups showcase the avant-garde and un-conformist nature of Melbourne. Art is not just an expression on a wall but a way of life that permeates every place and person in the strip. This alternative cultural centre of Melbourne was not the result of chance but the design of an astute city council in the early 1990s. Utilizing Federal government funds, a number of public art works including mosaic murals, sidewalk mosaics, mosaic covered lounges and a statue were commissioned along the street. My sojourn took me past interactive artworks that adorned the neighbourhood. Simon Normand's Gondwanaland laid bruised on the sidewalk. 3 sculptural mosaic couches by Giuseppe Roneri, each with their own personality sat on the corner of Victoria Street and Westgarth Street. Installed by metal artist Bronwyn Snow in 1992, the bench of iron and wood in front of Fitzroy Nursery reflected beauty and energy and encouraged contemplation while enjoying the comfort of its design. To emphasise the humanity that lived within the concrete housing, Bronwen Grey created 2 mosaic murals located on the buildings 90 and 140 Brunswick Street. She also added 3 Matryoshka dolls which softened the angular landscape and has come to represent the 3 generations of families living together in the Housing Commission flats. At the Brunswick and Argyle Street, a cast iron life-size tribute to a local poet Adrian Rawlins speaks to pedestrians. The statue, called 'Mr Poetry', was fashioned by Peter Corlett in 1994. Metal sculptures continue along the strip with decorative signs and oddities above many shops like the curled freakish dragons with a fin that spells "Polyester" above Polyester Books and the large mosaic head profile above Heading Out Hair and Beauty. Brunswick Street is a living, breathing gallery. From September to October each year, Brunswick Street celebrates arts, artists and art-making during the Melbourne Fringe Festival. But it takes more than an annual event to keep the lifeblood of art pumping through the street. Support for the Arts is a daily affair at Brunswick Street Gallery where a wide range of sensory stimuli including painting, printmaking, photography, drawing, sculpture and installation art from young and emerging artists are encouraged and promoted via galleries, bi-weekly shows and 6 major competitions. Add to this the weekly Rose Street Artist Market just off Brunswick Street where every weekend, around 70 artists, designers and craftspeople gather in a disused yard to display and sell their wares. Here I chanced upon the modern contemporary works of Ms Sierra Toner, a budding artist from Wollongong whose palette of music, recycling and art just seemed to go so well together, like rosemary and lamb. Simply Jamie Oliver wicked and begged closer scrutiny. There is no doubt Brunswick Streets lives and breathes Art. "Food is all about making tough decisions..."
The proverb of "too many cooks spoil the broth" simply doesn't apply to this food precinct bordering Melbourne's CBD. Brunswick Street's artistic flair for the unconventional, dishes up an eccentric consommé of tasty and delicious that puts many other food precincts to shame. The gumbo of alternative, trendy, artistic, vibrant and unassuming cafés, restaurants and bars serve a multicultural inspired palate of Italian, Greek, Spanish, Moroccan, Middle Eastern, African, Indian, Nepalese, Malay, Thai, Vietnamese and Vegetarian cuisine. Add to this gastronomic buffet your small hamburger joints, bakeries and gelato shops and we both share the same problem - choosing which one to enter. Arrive after dark and we've just compounded our problem with having to now choose from the paddles of pubs, wine bars, jazz and salsa clubs. 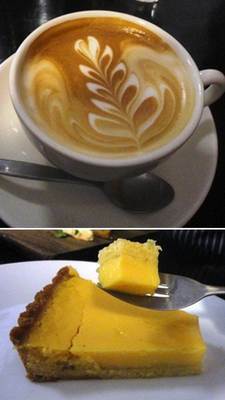 For better or for worse, I managed a seat in Atomica Café where the lemon tart hit the citrus spot and the latte gave me ample wings to finish the strip. I had a glimpse of the alluring décor of The Alchemist Bar and Café but it was way too packed. The handmade gelato of Trampoline Gelato was also out of my reach with the pressing crowd of fans. Guess I now have 2 legitimate excuses to return to Brunswick Street. I ended up with a Quiet American in Little Creatures Dining Hall which I first encountered in Fremantle, just outside Perth in WA. Nursing the seasonal ale, it dawned on me that Brunswick Street was just like a nicely shaken Martini, waltzing to the gentle rhythm of an attentive bartender. To truly imbibe the Brunswick martini, you have to appreciate the three star ingredients in the eclectic mixer – the City of Yarra, the suburb of Fitzroy and the shops that line Brunswick street. The City of Yarra, home to a diverse community, is like the dry vermouth which coats the sides of the Martini glass and provides the perfume. The inner city suburb of Fitzroy with its rich Victorian history and multicultural and socio-economic groups provides the smooth flavoured body of premium vodka. The cocktail pick of shops are the savoir-faire martini olives that finish the drink. 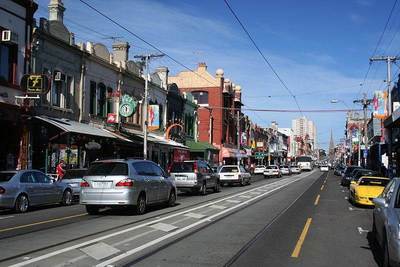 Like the hallowed Martini, Brunswick Street is a sacred mix in Melbourne's social history with its delicious balance of sophisticated allure and multicultural flavours. And it takes the gentle care of a city council to tend all the ingredients and produce a great result. Perhaps Mayor Geoff Barbour understands that a great dry martini should be shaken to waltz time and not stirred.